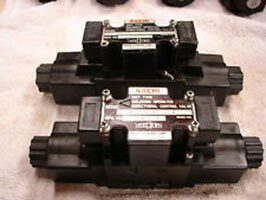 With the help of our professionals, we have been able to offer our customers a qualitative range of Nachi Solenoid Operated Directional Control Valve 9SS-G01-C5). Being a Supplier, Exporter and Importer, we ensure valve is efficiently designed and purchased from reliable vendors. It is made up with finest quality raw material that is procured from the reliable vendors of the industry. Moreover, our customers can avail this valve from us in different technical specifications at very reasonable rates within promised time frame.